”Our vision is to provide a high quality interpretive wildlife experience in a unique environment to a growing number of locals and visitors to the Top End. Our cruises are to surpass the expectations of our customers. Our mission is to strive for excellence in the delivery of our products and services in the most sustainable ways possible. 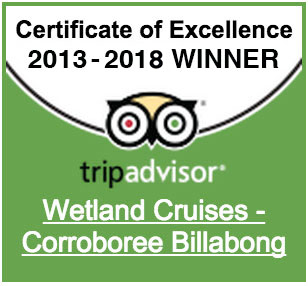 Corroboree Billabong is just over 100km from Darwin and is the closest location to the city offering cruises over the spectacular Top End Wetlands. Situated on the edge of Mary River National Park, this wetland habitat provides an ecologically sustainable environment and is a paradise for birds, fish, crocodiles and other wildlife. A visit to the Top End would not be complete without cruising these pristine wetlands and discovering a spectacular landscape that has not changed for thousands of years. We explore these wetlands on our charter boat where you will get a close up look at saltwater crocodiles and also see a host of exotic birdlife. We see an amazing variety of bird species within a very short period of time with regular sightings of Jabiru, Ibis, Brolga, Jacana, Egrets, Herons, Kites, Sea Eagles, Shell Ducks, Swamp Hens, Stilts, Spoonbills, Terns, Whistling Ducks, Darters, Cormorants, Fly Catchers, Kingfishers, Rainbow Bee-eaters, Magpie Geese and many others. 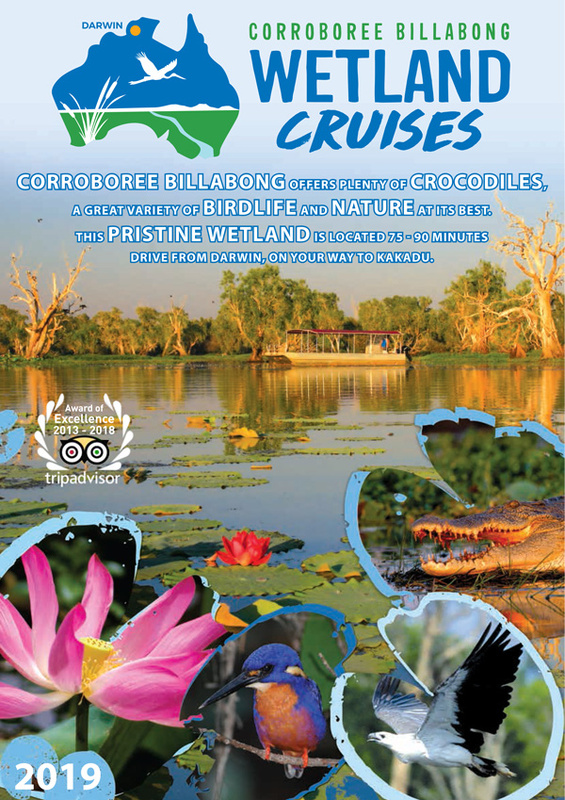 Wetland Cruises are the original cruise operator on Corroboree Billabong and have been operating here since 2001. We offer a selection of 1.0, 1.5, 2.0 & 2.5 hour cruises throughout the day for people with their own transport plus operate a 1 Day Tour from Darwin that includes hotel pick up and return transport to the cruise. Our cruises are informative and interesting as our guides possess extensive knowledge about the region and the wildlife that inhabit it.